A team from the Massachusetts Institute of Technology has received an award for its work on a biomimetic non-reflective coating for solar cells. The two-student team—named Glasswings after the glasswing butterfly—received $10,000 during the ninth annual MADMEC competition, according to a university statement. The students are working to create a low-cost coating for solar cells that mitigate reflection and allow the cells to absorb light more efficiently. 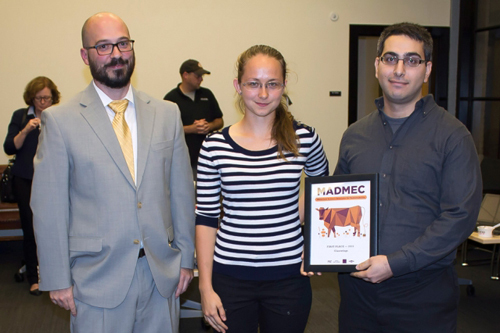 Michael Tarkanian, who runs MADMEC, stands with Alexandra Sourakov and Ahmed Al-Obeidi of Glasswings, the winning team of the MADMEC competition. Al-Obeidi and team member Alexandria Sourakov plan to use the money to continue research and development and potentially launch a company to commercialize their invention, the university said. The team set out to find a less-expensive solution to creating anti-reflective coatings. Although manufacturers use those coatings now in devices such as smartphones, photovoltaics and windows, the coatings are expensive and do not reflect all the light, the university said. Team members turned to nature and the glasswing butterfly to help them find a solution. The butterfly’s wings are coated with nanostructures that resemble pillars on pedestals. The “nanopillar” structures, according to the university, act like anti-reflective coatings that reflect just 2 percent to 5 percent of the light from the butterfly’s wings. That’s compared to typical solar cells made of silicon, which reflect 30 percent of the light and reduce efficiency. 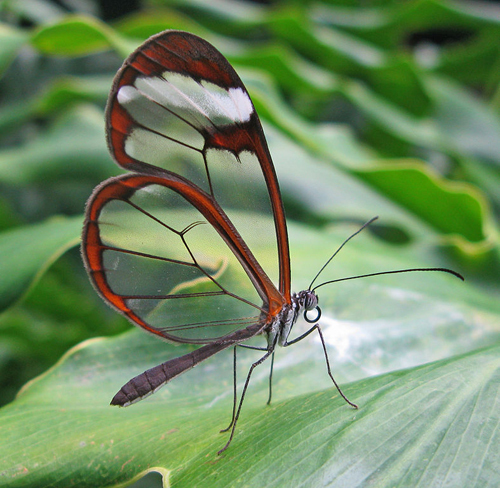 Team members turned to nature and the glasswing butterfly to help them find a solution to creating a low-cost non-reflective coating that absorbes almost no light. The students used common photovoltaic materials and fabrication tools to reconstruct the glasswing’s nanostructure. To do this, the university said, the team deposited oxide on a glass film and then applied a patterned mask of silver and etching with different gases. MIT said the trick was getting the etching gases tweaked so that the students could customize the nanostructure shape. “That structure’s very unique, because it’s been shown by modeling that that has the best optical properties…which has to be structured by things that are more complicated than this simple technique,” said Al-Obeidi. Al-Obeidi said the end result is cost-effective for solar cells if the price point is less than $14 per square meter. The university said the process also is faster than other anti-reflective coatings. The MADMEC event helps students develop prototypes and put what they learn in the classroom into practice, the university said. This year’s competition was sponsored by Saint Gobain, BP and Dow Chemical. The second-place winners of the 2015 competition—who took home a $7,000 prize—also worked on developing a coating. That team, called Lumos, created a photoluminescent road paint for use in crosswalks, highway lines and other road markings that absorbs sunlight during the day and glows at night.